Hello friends, sorry I had no new blog posts this week. My mom was discharged from the nursing facility. I have been busy assisting her. Last weekend, my husband and I attended the wedding of our dear friend's daughter. I will be posting some photos from the reception. It was a barn event. Hi Linda. All the picks this week are amazing. That lemon blueberry cake looks to pretty to eat. I bet it is so yummy. I am excited for your butterfly to emerge and also your baby praying mantis's. How exciting to see this part of nature up close and personal. Safe travels to Delaware. Glad you mom is doing better. Oh Linda, you are such a wonderful daughter in helping out your dear mom. Thank you for hosting and I hope this is a good week for you. Linda, thanks for another fun party. I'm glad your mom is improving. I know she appreciates all that you do. Have a terrific week! Thanks so much for hosting Linda! 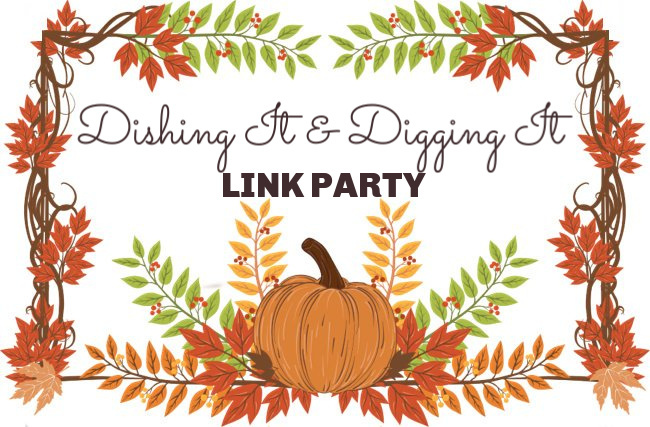 This week I am linking up my Harvest Fruits tablescape from the fall tablescape blog hop, a vintage "Junk-N-Pumpkins" fall dough bowl display, and my Vintage Cottage Style Early Fall Home Tour. I hope you enjoy them! Thanks for hosting another great party, Linda! Keeping you and your Mom in my prayers! Hope this finds you doing well hon....thanks for hosting this fun party as always. and a fun loving couple for sure. Who doesn't love to see wedding pictures....so enjoyable.